For those who could not attend the Open Data Bootcamp on 9/22, we wanted to share some of the work that was showcased during the Gallery Walk. Most of this work is in very early stages, so it comes with all the warts and hiccups that you would expect. Some of the work was completed during the bootcamp itself and others, of course, used personal time. Most are just dipping their toes into the project and are showcasing their progress, despite, reservations about displaying incomplete work. Many are also looking for partners and/or additional help so if you see something of interest, please reach out to the creators! Nathan Day is a local data scientist who has done some fantastic initial work with crime data. Most of this was done before the Bootcamp but was showcased during the Gallery Walk. 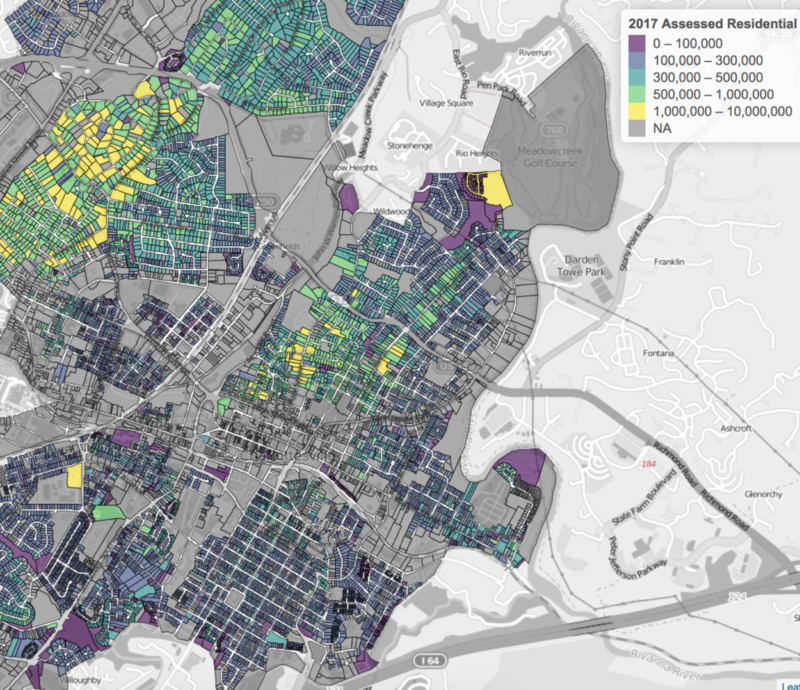 Data gurus Silas Turner and William Lanzana used R to create this informative map on 2017 residential assessment values in Charlottesville. Future plans: We want to look at change in assessments over time, volatility, land v. improvement, v total, and sales. Most of the improvements are based on linking other datasets to current geographic data set. Want to help? Volunteers and comments/questions to answer are welcome. 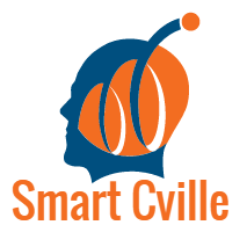 The code is at https://github.com/SiwTurner/Cville_RealEstate as well. Lucas Lyons is the fire department’s systems analyst. His project is a draft map to introduce citizens to the fire apparatuses assigned to respond to their homes in case of emergencies. To start this he performed an intersect in GIS between our four fire planning zones in the city and addresses found in the city’s GIS database (Parcel Boundary Area). Future plans: The fire planning zone polygons should be added to the open data portal soon. Geocoding the rest of the addresses in the city or working with city to get latitude/longitude data up by default on the Parcel Boundary Area set. Eventual addition of fire service performance metrics by neighborhood like EMS and fire apparatus response times. Want to help? 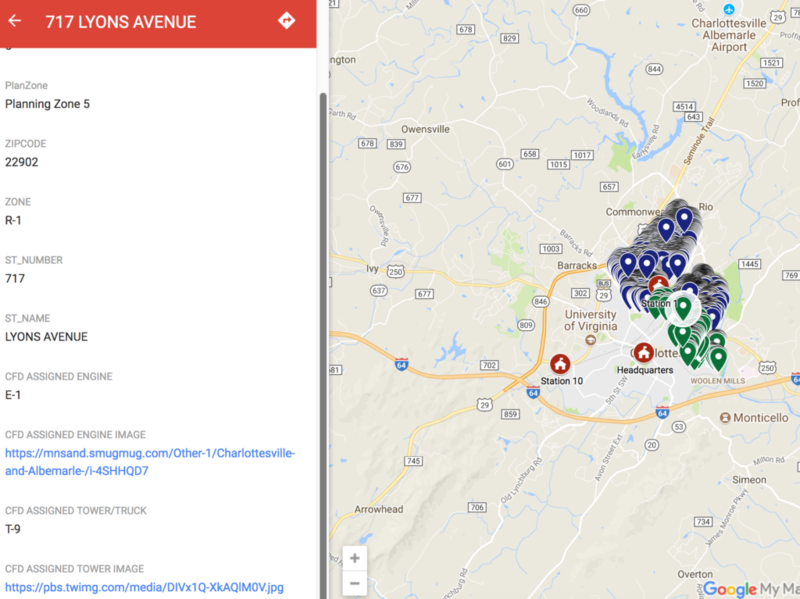 Contact Lucas at lyonsl@charlottesville.org if you want to assist in improving this project or have other ideas or questions regarding fire department data and geospatial applications. Students (high school and college) interested in internships or externships with the fire department are welcome to contact Lucas as well to discuss. Residents with a particular interest in learning more about fire and EMS performance measures in their neighborhood are also encouraged to contact Lucas. 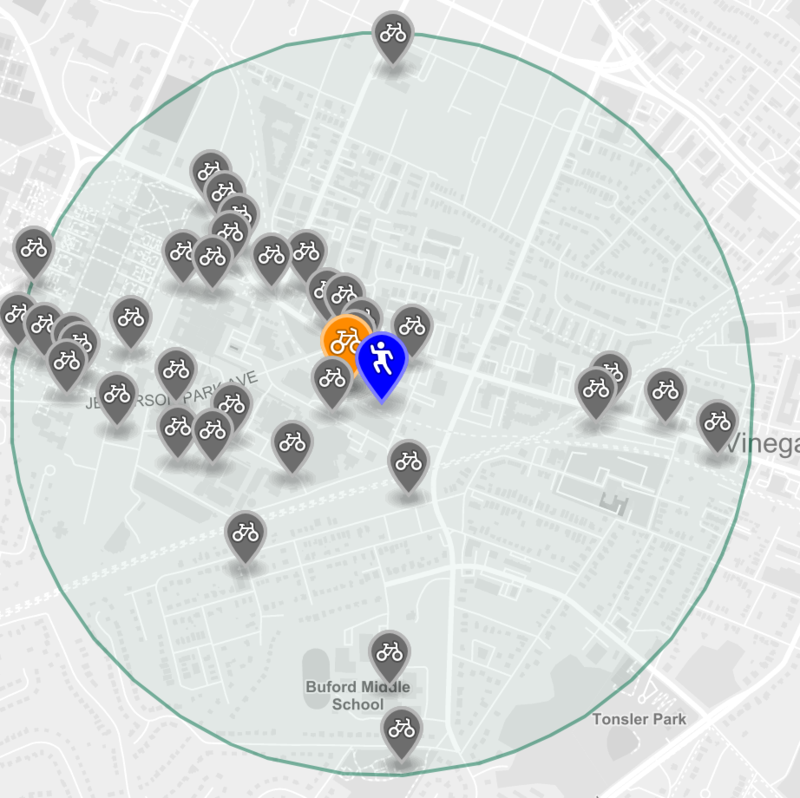 I created a basic search tool to find bike racks in the city. While I did not create it at the bootcamp, I did use it as a test project to see what could be created in the ~2ish hours of work time at the bootcamp. See our blog post for more details. Want to help? Contact us! We’re especially interested in seeing what could be done to improve the data. Department of Education and US Department of Education on academic performance, student population characteristics, and student-teacher ratios with elementary school zone boundaries, and allows the user to enter an address to determine the zone in which they live (a pin will drop in the map at the user’s specified address). Known issues: The VDOE/US ED data sets currently shown in the app represent some commonly used variables in education research but additional or alternative variables may be of greater interest to users. Future plans: Beyond polishing the interface and improving functionality, I’d like to think more about what specific school characteristics would be helpful to a user (e.g., a new family moving to Charlottesville and wanting to learn more about the City’s elementary schools). This entry was posted in Open Data and tagged bike, crime, education, fire department, real estate. Bookmark the permalink.